Henny van Hartingsveldt, born in 1952, was raised in Lisse, The Netherlands. At the age of 15 she takes her first lessons in ceramics at the studio of Henk van der Linden in Haarlem. In her home town Lisse she starts a pottery in the early ’70’s. After one year she combines the work in her pottery with a job in psychiatry. Years later in Groningen she takes lessons in ceramics and modelling at the ‘School voor Handenarbeid’. She also finishes her training in crafts. From 1986 she works in her own studio. After marrying Marc de Klijn and moving to Kampen in 1992, she again follows lessons in ceramics and modelling at the ‘Speelwerk’ (nowadays known as Quintus) in Kampen. 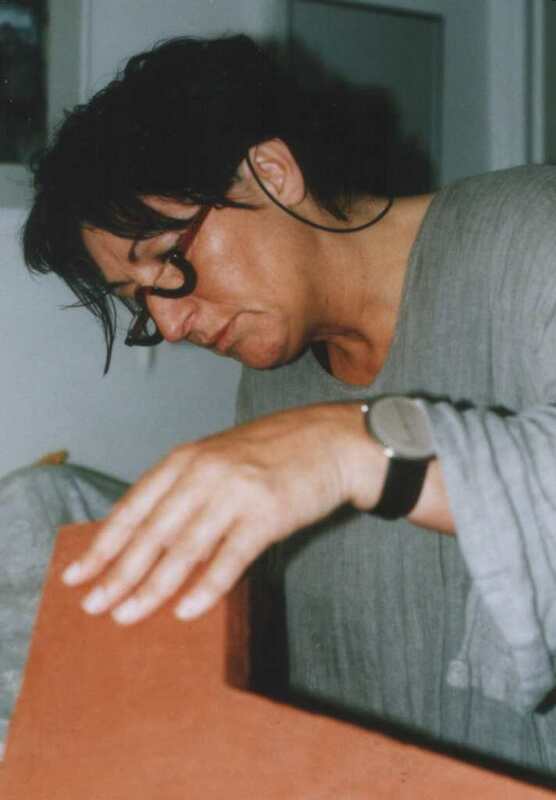 Since 1995 she works there in the open studio and since January 2003 as ceramics workshop assistant. Since 1994 she regularly has exhibitions both at home and abroad, solo and in groups. Fruit. An embryo of 12 weeks, vulnerable, not full-grown, but human. Bronze on a stand of Belgium stone, 15 x 8 x 4 cm, photo Henny van Hartingsveldt. Broken. A life-size rendering in steel of the ceramic sculpture The broken human. The ceramic sculpture is included in the book De doden zullen herrijzen. 60 x 182 x 60 cm, photo Ben Vulkers. My work has a thematic content. Before it materializes, a process of thinking, observing and meditation takes place. It may be that I am touched by a public or private event, a part of the Bible or a theme. Every year I also work with other artists on the basis of an annual theme. The coming into being of a sculpture is mostly a process of months, but it is also possible that inspiration arises out of the work process itself and puts me on a different track. I sometimes sketch, but most of the time I ‘see’ the sculpture in my head and if needed I develop it in clay, occasionally on paper. I prefer to work in clay – originally I was a potter after all. After 1990 I stopped with pottery and concentrated on hand-formed objects. My work is baked at 1200° C. Occasionally I bake in raku, a Japanese method. Through the years I started to combine ceramic objects with other materials, like wood, glass, metal and photography. Some works I have managed to realize in bronze and metal. My forms are first of all inspired by cubism. Besides this, I cannot escape influences by architecture and nature, which affect my designs. Most of all, structures of naturally shaped rock appeal to my imagination. Everything that I see and that touches me, I file in my memory. 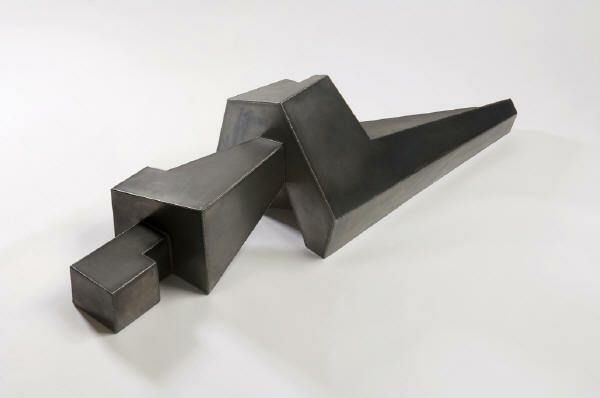 This starts as it were to live its own life and at a given moment the sculpture emerges that I want to produce. I like to work abstract on a monumental scale, a style with few outside influences and therefore showing a far more personal signature. Irrelevant details fall away in favour of the essence and the main lines. Besides this I like to sculpt human figures. In this work the individual human being is at the centre in all its diverse situations and qualities: proud self-conceit, fearful depression, but also vulnerable dependence. A number of images about the Shoah have been given a place in the book De doden zullen herrijzen (The dead will rise again) by Marc de Klijn. I strive to increase awareness in my viewers and to enhance their emotional experience of whatever is depicted. Symbolism and depth through multiple layers can regularly be found in my work. I see it as my challenge to touch and comfort people, to raise questions to which the close observer can respond personally. I would also like to enhance a sense of reality and offer hope. This challenge is more intuitively than intellectually inspired. Naturally my faith in the Eternal plays a role in this, as it plays a role in all facets of my life. Whoever has discovered and experienced the richness of the gospel, will never want to lose it again, but instead wants to share it. The secret for this is a life lived in close relationship with God and Jeshua Ha Massiach. Lightbearers. These sculptures originated as a result of walking the walls of Jerusalem. They are declarations of solidarity with God’s apple of his eye: ‘For Zion’s sake I will not keep silent, and for Jerusalem’s sake I will not rest, until her vindication shines out like the dawn, and her salvation like a burning torch’ (Isaiah 62:1 NRSV). Stoneware 1200° C, photo Henny van Hartingsveldt. Permanent work can be viewed in the Netherlands at the VVZ in Wezep, the GH in Zwolle, the Bazuinkerk in Kampen and De Eshof in Hoevelaken, in Jerusalem at Be’ad Chaïm and the Hansen Disease Center, and in private collections.